A BROTHEL madam, a saint, special groups of liberated women and countless prisoners influence the way Sr Margaret Robertson follows Jesus Christ. As she looks back on why she took the decision more than 50 years ago as a young woman to join the Sisters of St Joseph she cannot forget the example of her loving parents either. It was an exciting move for her to follow in the steps of Sr Mary MacKillop, but it was a few years down the track before she found where she truly belonged – in prison ministry. “You can’t actually say you enjoy prison chaplaincy but there’s something rich in it,” Sr Margaret said. And that brings her to the brothel madam. “One of the greatest lessons of my life (and when I had) the Gospels opened to me was in the old Boggo Road (jail), and it was in the time when you had a lot of the madams in prison … and there was that whole investigation into prostitution … and there would’ve been close to 50 women in the chapel (on this particular day),” she said. “No one wanted to do the reading so I started it, and it was that one where Jesus says that tax collectors and prostitutes will be in heaven before you, and one of the women who was an older woman who was one who worked with the prostitutes, she said to me, ‘You’re making that up’. The women in the group then started to search through their bibles to check for themselves “and there it was”. “And she said to me, ‘So you’re telling me that what Jesus is saying is that I’m going to be in heaven before you?’,” Sr Margaret said. “And I said, ‘You’re spot on. If I don’t do … If I’ve got to realise that much has been given to me, that’s spot on’. For Sr Margaret, this all adds meaning to two celebrations happening this year – the Year of Mercy and the 150th anniversary of St Mary of the Cross MacKillop’s Sisters of St Joseph. She has had a heart for the Josephites from the beginning, growing up in country Queensland, from Julia Creek up north to Warwick in the south, to Marburg midway between Toowoomba and Brisbane, and then closer to the capital, at Morayfield. Living the Mary MacKillop way started with the example of her parents Thomas and Ethel. “My parents, very much, were very involved in the community,” Sr Margaret said, recalling that her dad was active in the St Vincent de Paul Society. “We were always taking things out to a family to either deliver food or clothing or whatever. Young Margaret grew to love that way more under the influence of the Josephites as she came to know them as kind and happy people. As the family moved, she noticed it was the same with other orders like the Sisters of Mercy and the Presentation Sisters. 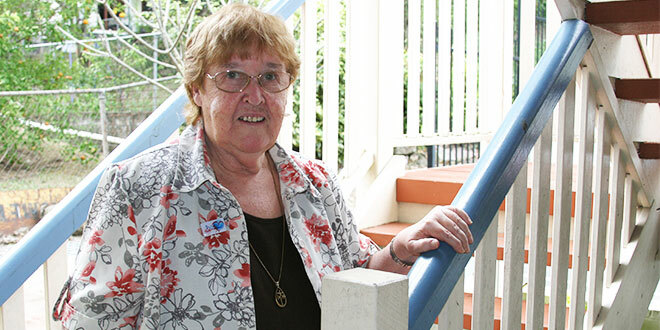 “I would have to say, I saw the nuns as very liberated women because, when I went to school, in my group of the young ones I used to knock around with around Morayfield and Caboolture, I was the only one who ended up going on to senior, because in those days girls didn’t go on to senior much,” Sr Margaret said. The religious women were, and still are, “very much women who were well educated, who were given opportunities a lot of women didn’t have”. “So I saw them as women who were liberated,” Sr Margaret said. Sr Margaret said she had always been “very happy” in religious life, partly because of the chance of being closely involved with people. “I’ve always said that somehow deep inside I knew that was my way to God – my world, my relationship – I got to know God through people. I really did … and especially now through the prisoners,” she said. “I just know there’s a deeper way I know God now that I would never have known if I hadn’t met these people. That kind of experience has sharpened and deepened through prison chaplaincy over more than 25 years, punctuated only by six years as the Josephites’ Queensland provincial from 2002-08. Sr Margaret, who now represents Centacare Brisbane’s Prison Chaplaincy on the State Chaplaincy Board for Queensland prisons, said work in the prisons was what “I really do think God called me to”. “If I just said, ‘What would I like to do?’, I would never have chosen prison ministry … because it is very hard … and it’s a very sad ministry,” she said. “You see a lot of the worst side of life. You see all of society’s problems impacting on human beings. “Basically I suppose when I was asked to live in the halfway house (for women prisoners with Sr Kath Carroll at Highgate Hill) it was just a Josephite thing to do. “I think justice and mercy go hand in hand, and you can’t have one without the other, and I think working with the prisoners that’s enabled me to understand what mercy is really about – not just for them, but mercy for myself – that we’re limited human beings and we stumble around here and God loves us,” she said. “I’m no expert on world affairs but I think as human beings we need to look at … we can’t just keep paying back. “Everything’s all about, ‘Somebody else is responsible so somehow I’ve got to do something to them’. The power of that hits home in prison. “When you do services in prison it’s fairly humbling to see a lot of grown men, big men, you see them quite emotionally moved by the words,” Sr Margaret said. “They hear Scripture in a different way. “We kind of go along to church, and hear it and hear it, but I’ve often had the experience of reading a Scripture and (the prisoners) want you to stop just to go over and over a sentence. “And they’ll be things like when Jesus has said ‘I’ve forgiven you’. “And it really hits you … because they’re experiencing it for the first time.